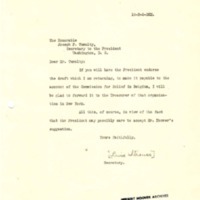 Lewis Strauss sends a check for the Commission for Relief in Belgium for the President’s signature. If you will have the President endorse the draft which I am returning, to make it payable to the account of the Commission for Relief in Belgium, I will be glad to forward it to the Treasurer of that orgianization in New York. All this, of course, in view of the fact that the President may possibly care to accept Mr. Hoowver’s suggestion. Strauss, Lewis L., “Lewis L. Strauss to Joseph P. Tumulty,” 1918 May 13, WWP19415, Hoover Institute at Stanford University Collection, Woodrow Wilson Presidential Library & Museum, Staunton, Virginia.